Spanking brand new. Posted in our “Corporate Governance Committee” Practice Area, this comprehensive “Nominating Committee Process/Director Nominee Qualifications Disclosure Handbook” provides a heap of practical guidance about the disclosure obligations under Item 407(c) of Regulation S-K, with a sample board matrix and other related policies and procedures included in the appendices. – Citibgroup’s profits of $11.1 billion, equivalent to 7.4 more SECs. – Citibgroup’s total assets of $1,873.9 billion, equivalent to 1,417.5 more SECs. – Other budget item of “Recreational and sporting services” is $4.2 billion, or 217.9% larger than the SEC budget. – What is the current state of diversity in healthcare organizations? – Why is diversity in leadership so critical at this stage in healthcare reform? – How can healthcare organizations’ board members play a role in promoting diversity in their institutions? – What are the best methods for CEOs to approach diversity issues within their organizations? Some members suggested the use of virtual shareholder meetings would allow companies to dodge such a problem (a notion I will rebut some other time, but see yesterday’s blog). Some welcomed the challenge – some quivered in their boots. Some journalists even contacted me because they had been frozen out of recent shareholder meetings and wondered if that was legal (more on this later too). For those planning your annual meeting and it is likely to be the target of demonstrations, I urge you to review the transcripts of the numerous webcasts I have held over recent years on “Conduct of the Annual Meeting” including the great one I held last month (these transcripts are posted in our “Annual Stockholders’ Meetings” Practice Area). You want to be prepared – but not overreact either. From Suzanne Rothwell, Several years ago, I participated in a webcast on this site with Mike Emen, Senior Vice President, Nasdaq’s Listing Qualifications Department. At that time, Mike mentioned that he was starting to do the legwork to revamp how the Nasdaq rules were posted, add more FAQs and exemption/interpretative letters and generally make information more available online regarding listing standards, corporate governance and compliance requirements to assist companies and their advisors. All this – and more – has been accomplished. In addition, Nasdaq currently is in the process of changing hard-copy listing and other filing/notification forms to electronic submissions. Given so many changes to the Nasdaq website, some practitioners are having trouble finding the location of these materials. In our “Nasdaq Guidance” Practice Area, we have linked to all of the primary materials. One of these is the “Nasdaq OMX Listing Center,” where a user can create an account in order to complete and electronically submit required forms. The Center now supports the electronic submission of Corporate Governance Certifications and Listing Agreements. Listing Applications, Listing of Additional Shares (LAS) Notification Forms and Requests for Rule Interpretations. – Director Troubles: What Now? – Doing Diligence for Related Person Transactions: How Far Do You Go? Over the years, I have wavered – yes, even flip-flopped – over whether allowing companies to hold virtual annual shareholder meetings (ie. without any physical audience) is a good idea. More recently, I had gotten comfortable with the notion that it might be okay for companies that know that their meeting will be held without any controversy. The problem is how do companies really know this when so much of their vote comes in typically within the last 48 hours or so? The agency also is hiring 17 new staff with economics doctoral degrees, which would nearly double the number of Ph.D. economists already on staff to assist with rule-writing, Schapiro said. The agency seeks to hire an additional 20 economists for the fiscal year beginning Oct. 1, she added. And as noted in this Reuters article, Chair Schapiro noted that the SEC wouldn’t be revisiting the proxy access rulemaking anytime soon. That should be no surprise given all the JOBS Act and Dodd-Frank rulemaking still on Corp Fin’s plate. And here is more testimony from Chair Schapiro that she delivered yesterday about the status of the agency’s rulemaking and how many more Staffers they need going forward, etc. As noted in this recent NY Post article, Georgeson has been subpoenaed in the investigation regarding an ISS employee allegedly selling shareholder voting data. A few weeks ago, MSCI – the owner of ISS – confirmed that an ISS employee tipped off a proxy solicitor to votes by ISS clients. As explained in this Form 8-K, the employee told MSCI “that he provided information to a proxy solicitor over a number of years about how a number of ISS’s clients voted their proxies. The employee has stated that the proxy solicitor in question provided him with meals and tickets to various events.” MSCI believes “the employee communicated the vote information by using his personal email accounts and by telephone and that he acted alone in gathering this information and communicating it.” The employee was terminated by ISS on March 26th and MSCI says it has been cooperating with the SEC and DOJ. Recently, some commentators have applied ISS’s policies to its parent’s – MSCI – practices and been critical, such as this Reuters article and Exequity alert. – What is your goal with SECWhistleBlowerAdvocate.com? – Any surprise reactions to it? – How do you screen whistleblowers when they approach you? How do you do diligence? – Do you ever contact the company to check on the whistleblower’s story? Citi Gets Hit With Say-on-Pay Lawsuit in Record Speed: Before 8-K Filed! As the bloggers on CompensationStandards.com were quick to point out, Citigroup was hit with a say-on-pay lawsuit within two days of the revelation that it had failed to garner majority support for say-on-pay at its annual shareholders meeting last week. In fact, Citi’s Form 8-K reporting the vote results was filed on Friday – and the complaint was filed in the US District Ct.- SDNY on Thursday. The lawsuit was filed before the 8-K! On April 5, 2012, the Jumpstart Our Business Startups (JOBS) Act was signed into law. The Act requires the Commission to adopt rules to implement a new exemption that will allow crowdfunding. Until then, we are reminding issuers that any offers or sales of securities purporting to rely on the crowdfunding exemption would be unlawful under the federal securities laws. Lot of wild stuff going on, like the Wal-Mart revelations I blogged about yesterday on “The Mentor Blog.” Then yesterday, the SEC brought a fraud case against the former CEO of CalPERS – and as the complaint notes, another California fund refused to engage in the same activity as this CEO did. Based on the allegations in the complaint, there seems to have been serious fiduciary violations to the investors in CalPERS Fund, in addition to the fraud charges brought by the SEC. See Keith Bishop’s blog analyzing the situation. Then tune in next Wednesday, May 2nd, for the companion webcast: “The New World of IPOs: Dissecting the JOBS Act” – Corp Fin Deputy Director Lona Nallengara was just added to the panel – as we all try to get a handle on a number of murky areas in a quickly evolving marketplace, as intimated in this recent WSJ article. On Friday, Corp Fin issued the latest in its “CF Disclosure Guidance Topic” series with “Topic No. 5: Smaller Financial Institutions.” This guidance provides a long laundry list of what the Staff is seeking from small financial institutions in MD&A. As noted in this announcement, the SEC will ensure that stop orders will appear in a company’s Edgar stream rather than just show up on the agency’s “administrative orders” page. 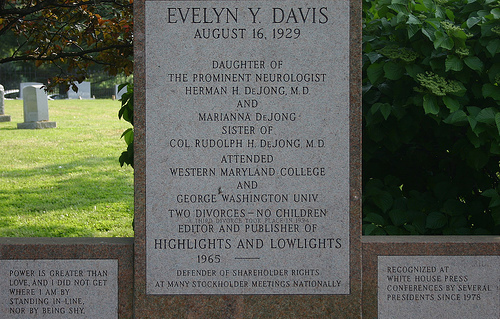 For many of you, the news that Evelyn Y. Davis is slowing down at age 82 will come as a mid-proxy season boost. As noted in this Chicago Tribune article, Evelyn has been skipping annual meetings this year – and even has halted production of her 47-year-old self-published newsletter “Highlights & Lowlights,” a $600-an-issue review of her governance battles that regularly features photos of her with bemused CEOs. Although Evelyn still has been submitting shareholder proposals to companies, I haven’t heard of her actually attending a meeting for the past two years. For those of you who have never had the pleasure, go ahead and ask an old-timer for their favorite EYD story. Many of them are unsuitable for print in this family blog. I do note that she is partial to men, particularly if they are CEOs of a Fortune 50 company. Evelyn always had remarkable success with access to the powers that be – and making the CEO available to her often was a wise decision as it made it more likely that she wouldn’t turn your shareholders meeting into a complete spectacle. One day I’ll collect stories to post (including my own). I do note that Evelyn has been quite a philanthropist over the years, particularly in the effort to preserve Chicago history. As noted in this Davis Polk memo, the SEC approved a significant overhaul of FINRA’s rules governing members’ communications with customers and the public. The revised communication rules will simplify and reorganize existing rules by reducing the number of communications categories from six to three. The new rules will also implement some noteworthy changes, such as the requirement to file with FINRA within 10 days of first use retail communications relating to registered structured products. FINRA will publish a Regulatory Notice by June 27, 2012 announcing an implementation date for the new rules that is not later than March 29, 2013. FINRA acknowledges that members will need time to alter their internal policies and procedures in response to the new requirements, and has stated it will take this into consideration in establishing an implementation schedule. Over the past week, Citigroup (45%) and KB Home (46%) joined the club of those failing to gain majority support for its say-on-pay. A list of the Form 8-Ks filed by the “failed” companies is posted in our “Say-on-Pay” Practice Area. Citi has not yet filed its Form 8-K reporting the voting results – but did address the failure in its “Citi Blog” (which oddly has no comments after this CEO pay entry). The Citi failure was front-page news for the WSJ, NY Times, etc. and I spoke at an event in NYC last night and it was the hot topic (besides the JOBS Act). This turns out to be Citigroup’s fourth “Say on Pay” vote since 2009 – the first two were as a participant in the Troubled Asset Relief Program. I took at look at the support for the company’s executive compensation program over this entire period, which went from 82% in 2009, 89% in 2010, and 93% in 2011 to just 45% in 2012. So it appears that there was a fairly consistent level of support for the program, which spiked in 2011 (the second consecutive year in which the company’s CEO received essentially nominal compensation – $1 in 2010 and $128,000 in 2009) before the bottom fell out. As part of the process for making incentive awards to the named executive officers for 2011, the committee considered the most recent “say on pay” non-binding stockholder advisory vote held in April 2011 regarding the named executive officers’ 2010 compensation. The resolution approving 2010 executive compensation received a 92.9% favorable vote. Several key features of the 2010 program for named executive officers are carried forward to this year, such as substantial deferred amounts, performance-based vesting of certain deferred incentive awards, a four-year deferral period, significant stock awards that are subject to clawbacks and a stock ownership commitment, and limitations on perks. To better understand the reasons for the favorable say-on-pay vote and potential stockholder concerns for 2011, management engaged in stockholder outreach at various times during 2011 to discuss executive compensation in the context of Citi’s sustained profitability. In particular, management sought a better understanding of stockholder views on Citi’s disclosure and compensation processes and the priorities of our investors. The committee considered the outcome of the most recent say-on-pay vote and stockholder perspectives generally as factors in the 2011 compensation process in addition to currently applicable regulatory requirements, market considerations, and company and individual performance. – How do your improv workshops work? – What are the benefits of using improv to earn CLE? – Have you ever done an improv workshop at a law firm? – What’s the funniest moment that has transpired at one of your workshops? When you work in-house, you wind up working on some funky stuff. Back in what now seems like a lifetime ago, I was in-house at Lockheed Martin and besides the typical securities & disclosure stuff, I supported the Treasury function. One of the coolest things I worked on was a synthetic sale-leaseback for a spaceport down in Cape Canaveral, home of the Atlas V rocket. The law firm expert in complicated sale-leasebacks said it was the most challenging deal she ever worked on. Anyways, after the deal closed, I was invited down to watch a space shuttle launch but I was always too busy to make it. One of my life’s true regrets because I heard many stories about how it was one of the wonders of the world. Don’t feel bad for me though, I received some very nice closing gifts including this framed set of pictures (including one showing the demolition of the old spaceport – that was a community event when they did it, like when Vegas blows up one of its old hotels) – see below. The happy ending is that my office rocked off its hinges a few day ago when they flew the Space Shuttle to it’s new home in the Smithsonian’s Air & Space museum out near Dulles airport. Wow! New “Deal Cube Gallery”: Email me photos of your coolest – and most tacky – deal cubes or other deal momentos as I will place them in a new “Deal Cube Gallery” on this site and run a competition allowing folks to vote. You will remain anonymous as a source if you so wish. Spanking brand new. Posted in our “Board Composition” Practice Area, this comprehensive “D&O Biographical/Director Qualifications & Skills Disclosure Handbook” provides a heap of practical guidance – including a sample board resolution to designate executive officers and sample D&O questionnaire language. In particular, the Handbook focuses on disclosure obligations under Item 401(a) through (e) of Regulation S-K.
– How does Moxy Vote work? – What is J&J’s involvement with Moxy Vote? – How did J&J’s collaboration with Moxy Vote begin? – What have been the experiences so far? As noted in this press release, in a Section 304 of Sarbanes-Oxley clawback action, the SEC sued both the former CEO and CFO of ArthroCare recently to recover bonus compensation and stock sale profits they received during an accounting fraud at the company. The two former officers had not been personally charged in connection with fraudulent financial statements; two other former officers were charged for that last year. This jibes with the District Court of Arizona holding in SEC v. Jenkins – that disgorgement of compensation and profit under Section 304 does not require personal misconduct. By my loose count, the SEC has used Section 304 at least seven or eight times since its birth in 2002 – see the list of links to SEC clawback actions in CompensationStandards.com’s “Clawbacks” Practice Area.